As you can learn from this Subaru Forester review, the crossover is ready for our worst weather challenges. Shoppers don't have to pay extra to get efficient all-wheel drive. The Subaru is built high enough to deal with snow drift, but low enough to ensure the best handling when the roads are clear. Having earned Top Safety Pick Plus from the Insurance Institute for Highway Safety, the Forester is poised to protect the family. It also earned all five stars on its federal crash tests. Class-leading EyeSight protection covers the front, rear, and sides, helping the driver stay more alert to the dangers around the vehicle. For families, the Forester offers ample room for a small crowd of four or five. The large cargo hold easily expands, doubling your flat hauling space. Southfield Michigan drivers can get everything they need for our coldest days. This includes dual climate controls, heated seats, and a heated steering wheel. The best place for 2017 Subaru Forester research is your Michigan Subaru dealership. You can take a test drive at Glassman Subaru. The 2017 Subaru Forester has new LED accent lights, revised wheel designs, and an enhanced hexagonal grille. Inside there's a new steering wheel and much more insulation to keep out road noise. Better handling is easier with the crossover's quicker steering response. The biggest change is the new generation of EyeSight with upgraded cameras and more features. The package now includes a lane-keeping assist, blind spot detection, and a rear cross-traffic alert. This enhances the other features which include a lane departure warning, forward collision warning, and adaptive cruise control. Higher trim level EyeSight packages add reverse automatic braking, automatic high beams, and adaptive LED lights. Another advancement, brake-based torque vectoring actively brakes the inner front wheel, thus allowing the three other wheels to match its speed. Research for Forester shoppers must include an understanding of the price vs. value on a vehicle. In this case, Subaru has priced the Forester competitively, offering a range of trims to suit different shopping needs. Industry research analyst ALG has recognized the Forester for having the best residual value in its class. Likewise, the leading automotive research analyst Kelley Blue Book has given the Forester one of its Ten Best Resale Value Awards. The availability of EyeSight on most models helps make crash avoidance features more affordable to more people. As part of this Subaru Forester review, it should be noted that it offers some aspects that you won't find on rivals like the Honda CR-V or Toyota RAV4. This includes brake torque-vectoring and automatic reverse braking. In addition, the Forester has 8.3 inches of ground clearance, beating competitors by an inch or two. Furthermore, the 2017 Subaru Forester has the best all-wheel drive fuel economy when compared with AWD editions in its class. The crossover earns 32 mpg on the highway. 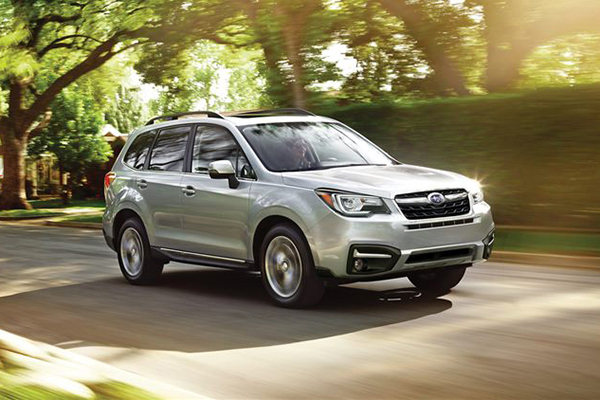 With the Forester, Southfield Michigan crossover buyers get a choice of engines and transmissions. You won't find many in this class that offer a six-speed manual as well as an automatic. The Subaru continuously variable transmission allows it to achieve the highest AWD gas mileage in its class. The 2.5-liter four-cylinder cranks out 170 horsepower, creating ample momentum for your daily commute. The two-liter turbo kicks out 250 horsepower and 258 lb.-ft. of torque for an even faster ride. It still manages to earn 27 mpg/highway. Research for Forester shoppers should also note that the crossover has been designed for better aerodynamics. Most editions offer alloy wheels, reducing unsprung weight. For the worst low friction surfaces, the Subaru X Mode helps channel the power to the wheels that have grip. It also has hill descent control to reduce the stress of downhill braking. The base 2.5i edition has a 6.2-inch touchscreen with smartphone app integration. A rearview camera, HD radio, and a USB port are standards. For a fancier ride, the 2.5i Premium wears a panoramic sunroof and a rear roof spoiler. Drivers will appreciate an eight-way power chair and automatic climate control. Backseat riders enjoy reclining seats, cupholders, and a rear armrest. Enhancing entertainment and connectivity, the touchscreen is larger with more voice command capability. There are more audio speakers and two USB ports. Heated side mirrors and heated front seats are optional. The 2.5i Limited has a power liftgate, upgraded side mirrors, automatic headlights, and foglights. The Limited interior is dressed in leather and wears different dashboard trim. Adaptive LED headlights and automatic high beam control are added with the EyeSight package. The 2.5i Touring gets high tech with the adaptive headlights, push button start, a dual-zone climate system, an upgraded instrument cluster, and one-touch folding rear seatbacks. The Harman Kardon sound system offers premium sound. With EyeSight, the buyer also gets automatic high beams and a heated steering wheel. The 2.0XT Touring has its own special look but it offers almost every aspect of any other model, including the EyeSight package. For more 2017 Subaru Forester research, contact the staff at your Michigan Subaru dealership, Glassman Subaru. *The above information is regarding the base model 2017 Subaru Forester. Standard specs and features may change from year to year. Contact Glassman Subaru with any questions regarding the new or used vehicle you're inquiring about.